This is the perfect season to make different types of sun dried food items which can be preserved for the whole year. 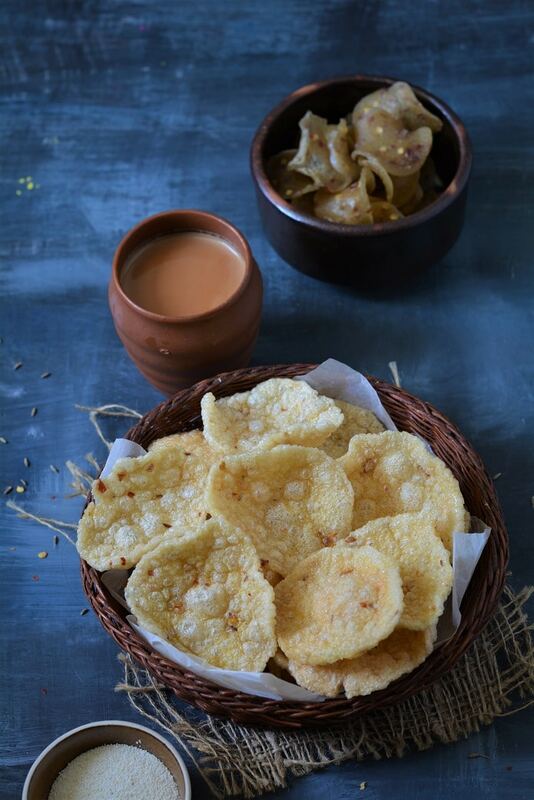 In fact In India we start making papad and chips before the Holi festival and continue making before the the heat become harsh and too hot to sit on the roof or in your balcony open space. Though now so many varieties of Papad and chips are readily and easily available in the market but I still love to make my own batch of chips, papad , Moong Daal mangodi and pickles every year. 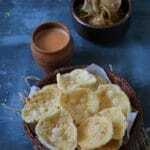 My favourite is Aloo Papad and Sun dried Aloo Chips and I always make big batches of both. This year I tried making Sooji papad and they turn out awesome, very easy to make and taste crisp and delicious . 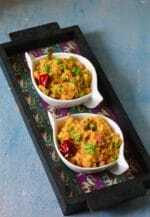 The method of making sooji papad is very easy as compared to making aloo papad . Make sure to cook the batter properly and to the right consistency and do keep stirring it else it may stick and burn at the bottom. 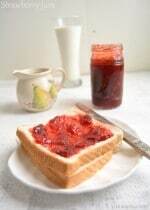 Use heavy bottom pan to cook the batter ,I have used my pressure cooker to cook the batter. I added chili flakes but you can add crushed pepper corns or green chili paste or just omit chilies if you are making for your small kids. In a heavy bottom pan add water and semolina and salt, mix well. Now cook it on medium heat and keep stirring. 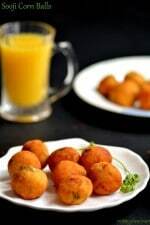 Cook till it start to thicken and become like pakora batter or looks spreadable ,it will take around 8 minutes minimum. Switch off the flame and cover it with a lid and let it cool down slightly for about 10 -15 minutes. Now add cumin seeds and chili flakes and stir to mix properly. Lightly grease a thick plastic sheet or steel plate or tray. Pour about 2 tbsp mixture on the plastic sheet and spread gently to make a medium thick circle. don't make it too thin else they will break while turning the side. Turn the side when they are semi dried and then Sun dry for 2-3 days till they are completely dried. Store in a container and keep in a dry place. 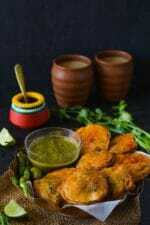 Deep fry in hot oil when you want to serve, can sprinkle some chat masala on the fried papads after frying. # 8 you say: Turn the side when they are semi dried and then Sun dry for 2-3 days till they are completely dried. How long does it take to be semi dry? Same day? Do clarify or we will make a big mistake! Meera when they start to dry from the outer circle and you can easily lift them without breaking or mashing then they are semi dried,if you still have confusion then let them dry completely without turning the sides,in that case they will take little extra time to dry completely.If its a hot sunny day then they will semi dry in a day.